Who doesn’t love pizza? Homemade pizza adds a level of fun and excitement to your family meal, but if you are gluten-free this becomes a bit more of a hassle than many are willing to handle. That’s why the Udi’s Gluten Free Foods’ two-pack of Udi’s Gluten Free Pizza Crusts, found in your grocer’s frozen aisle, is so convenient. Udi’s Gluten Free Pizza Crusts come as a pack of two 8” round, frozen crusts. It solves the problem of making your own crust from scratch and waiting for it to rise, or having to roll out a messy mix, when you can’t eat a regular, white flour-based crust. Simply add your favorite toppings, bake in the oven or on a pizza stone for a mere 5-7 minutes and it’s pizza time. 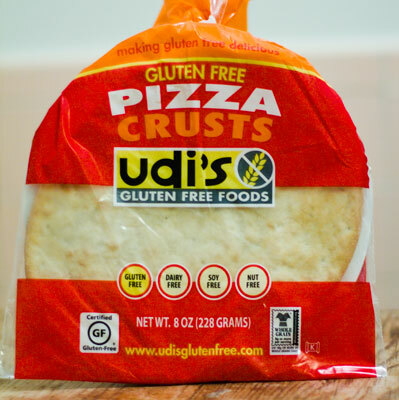 Udi’s Gluten Free products, such as the pizza crusts, can be found online and ordered in bulk through the manufacturer’s website and sites such as Amazon. They are also available in some grocery stores in the specialty aisles or in specialty food stores like Whole Foods and Trader Joe’s. The product is a certified gluten-free product and naturally dairy-free, soy free and nut-free. It is lightly dusted in a rice flour. When you bite into the finished pizza product, the same rice flour, used as the base ingredient, creates a light, wholesome, pillowy, thin crust with a slightly sweet flavor. It’s a pleasant surprise to find how cheap the 2-pack of pizza crusts are ($5-$8 per pack) compared to other gluten-free products, which can really put a damper on your bank account. If you were to compare and contrast prices of this gluten-free pizza crust and a regular frozen pizza crust or tube of pizza crust dough, you would be disappointed that the cost is so high. But you have to remember, you are getting two crusts for the price of one. Unfortunately, this product contains egg, so it is not vegan-friendly. You can make it vegetarian friendly based on your choice of toppings, but through personal trial and error, you should try not to pile on too much sauce or too many ingredients. The crust tends to hold in liquid, making it really soft. Then it has a hard time holding a lot of ingredients. A simple solution is to eat it with a fork and knife. This crust is sure to delight both gluten-free eaters and wheat-encrusted, carb-heavy consumers alike. Udi’s Gluten Free Pizza Crusts were used as a giveaway to Hollywood elite attending the 2012 Sundance Film Festival in which Udi’s Gluten Free products were passed out to ecstatic gluten-free celebs like Annalynne McCord and interested gluten eaters such as Lil Jon, Emily Blunt, Ice T and William H. Macy. With all Udi’s Gluten Free Crusts have to offer, you will be pleased with your tasty purchase. It’s definitely worth spending a few more dollars on.